1. Preheat the oven to 160°C, gas mark 3. Put the chicken thigh fi llets in a roasting tin and drizzle with 1 tbsp oil. Season and scatter over the garlic and fennel seeds; mix well. Line a baking tray with parchment; lay the sliced tomatoes on top. Season and drizzle with the remaining ½ tbsp oil. Put both trays in the oven and cook for 1 hour, adding the pancetta to the chicken after 30 minutes. 2. Meanwhile, mash the avocado with the lemon juice; season. 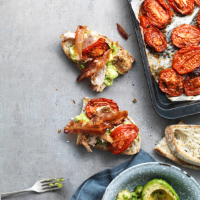 Spread over 2 of the sourdough slices and top with the chicken, roasted tomatoes, pancetta and a second slice of bread. Eat while still warm.